Today I’d like to review a site that’s been around for awhile that I’ve reviewed a few years back. Since my last review, they’ve added new features so I thought it’s time to update and show you how you can earn at SliceThePie. SliceThePie originally started as a site to get paid to review music but has now expanded to writing reviews in several categories. Please keep in mind that SliceThePie is just extra income, there is no way for this site to make you rich! 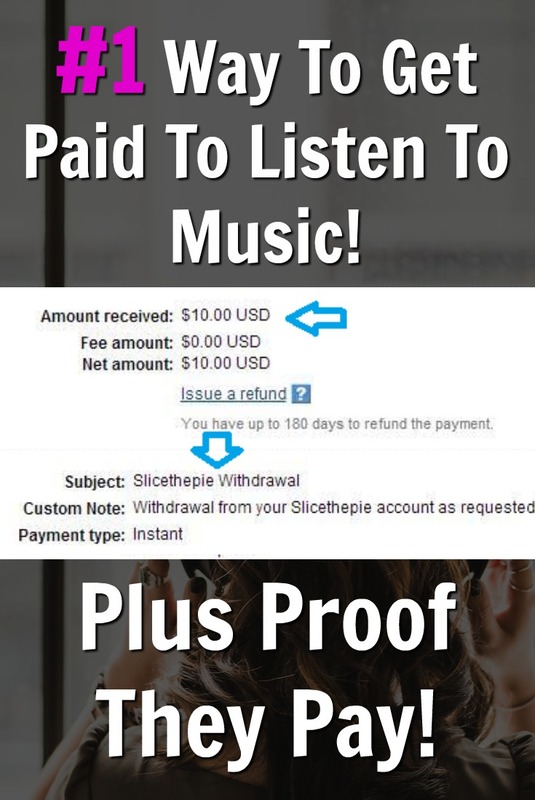 In this SliceThePie review, I’ll tell you how it works, how to get paid, show you proof they pay and give you some tips on how to make the most money possible. SliceThePie is a website that pays you to write reviews. The reviews consist of several categories, including music, fashion, homewares, and mobile. Your opinions help artists and brands to make decisions. Since the site has been established, they have paid out over $3 million to reviewers, and have had over 26 million reviews submitted. SliceThePie pays you to write your opinions on the category of your choosing. To successfully submit a high-quality review, there are a few key rules to follow. Firstly, make sure to pay attention to your spelling, grammar, and punctuation. The more varied, detailed and descriptive you can be with your reviews the better. If you choose to listen to a music soundtrack, you have to listen to at least 90 seconds of the song. You should say what you like about the song, and also provide constructive feedback on anything you don’t like. Describe what you like about the vocals, instrumentals, and so on. Rate the song out of 10. With fashion, mobile and homeware categories, you should be as detailed as possible – let them know what you think of the color, style, design, etc. and whether or not you would personally buy it. You then rate it out of 10 and say how much you think it would cost – a maximum and a minimum price. There are some issues that you could run into when writing a review – the algorithms can pick up on whether or not you are repeating yourself too often – if your reviews are sounding too similar. If this is the case, a message will pop up telling you so, and you are given a chance to edit your review. You could also get a message telling you that your review isn’t specific enough. Try and stay on topic, focusing on the design, detailing, colors, patterns and so on. How Does SliceThePie Pay You? Your payment per review is based on your Star Rating and quality of the review. The more stars you have, the bigger your payment will be, including bonuses. From time to time SliceThePie will pay bonus amounts depending on what category is the priority at the time. I have had bonus payments in the past, ranging from $.15-$.37 per review. This can boost your balance nicely, so it is worth checking for times that they are paying bonuses. When I first joined SliceThePie, I had a low Star Rating of two out of five stars and was getting paid 3 cents per review. Over time as I submitted more reviews and thus increased my Star Rating to four out of five stars, my pay also increased. On average the pay at the moment is around 5 cents per review. However, this can vary at different times of the year – in the past, my average pay was around 10 cents per review. Your Star Rating is also compared with other reviewers. Payments are made via PayPal, make sure when you sign up your email address matches your PayPal email. You will also need to input your Date of Birth. Slicethepie pays on Tuesdays and Fridays, and I have been paid on both days. When I withdraw my earnings on either a Thursday or Monday evening, I will get it the next day – roughly around 24 hours later. The minimum amount you can withdraw is $10. When I write about legitimate sites, I try to include payment proof to show you they really pay. Below I’ve included a screenshot of a $10 PayPal payment from SliceThePie. I really like the bonuses they give out for high-quality reviews. The $.37 bonus I received in the past was a great way to earn some extra money. I was able to increase my balance very quickly when the bonus payments were generous. It is worth checking the site every so often as they do pay bonus payments on occasion, and the amounts vary, but they can help to get you to the $10 cash out quicker. I also like that they have always been reliable, and have paid me every time for my reviews. If you enjoy listening to various types of music, it would be a nice way to get paid for providing your opinion while you listen. From time to time the pay can go fairly low in my experience. At the beginning of the year, the pay rate dropped to 4 cents per review before increasing again. It could potentially be a little discouraging if you have previously been used to higher payments, but having said that I did find that my payments increased after a while. You could potentially lose a Star from your Star Rating if your reviews do not remain consistent with a satisfactory standard of well-written English – resulting in reduced pay. It is not a get rich quick site, and can at times take a long while to reach the $10 payment threshold. It also does run the risk of becoming a little repetitive, so I would advise taking lots of breaks in between your reviews so that you can come back to it with a fresh mind – helping to avoid frustration or becoming bored. It may be better to think of SliceThePie as a slow burner – something you could do once in a while and slowly build up your balance. It is a reliable site, and I have been paid every time I have cashed out, earning a total of $49 since I joined a few months ago. It requires a good standard of English, and the ability to provide detailed and varied reviews. If you enjoy getting paid for your opinion on the categories mentioned, then I would recommend trying it, along with the knowledge that it is not a get rich quick site. If you’d like to learn more or to join, visit SliceThePie.com to join for free. If SliceThePie doesn’t sound like a good option for you, make sure to check out all of the ways I make an Extra Income Online! Looking for a large online income? Check out My #1 Recommendation to learn how to start a blog and work at home! Have questions or experience with SliceThePie? I’d love to hear your thoughts in the comments section below!